The rest of her story is well known. In 2004, Hirsi Ali collaborated with Theo van Gogh on the film "Submission," which examined the link between Islamic law and the suffering of millions of women under Islam. The reaction from the Muslim community was nothing short of psychopathic, and it confirmed the necessity of Hirsi Ali's work and the reasonableness of her fears. Van Gogh, having declined bodyguards of his own, was gunned down and nearly decapitated on an Amsterdam street, and a letter threatening Hirsi Ali was staked to his chest with a butcher knife. Hirsi Ali was immediately forced into hiding and moved from safe house to safe house, sometimes more than once a day, for months. Eventually, her security concerns drove her from the Netherlands altogether. She returned to the U.S., and the Dutch government has been paying for her protection here -- that is, until it suddenly announced last week that it would no longer protect her outside the Netherlands, thereby advertising her vulnerability to the world. 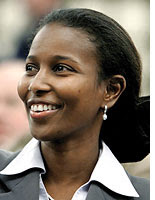 The Dutch Parliament will be debating Hirsi Ali's case this week. As it stands, the government's decision to protect her only within the borders of the Netherlands is genuinely perverse. While the Dutch have complained about the cost of protecting Hirsi Ali in the United States, it is actually far more expensive for them to protect her in the Netherlands, as the risk to her is greatest there. There is also the matter of broken promises: Hirsi Ali was persuaded to run for parliament and to become the world's most visible and imperiled spokeswoman for the rights of Muslim women, on the understanding that she would be provided security for as long as she needed it. Zalm, in his capacity as both the deputy prime minister and the minister of finance, promised her such security without qualification. Most shamefully, Jan Peter Balkenende, the Dutch prime minister, has recommended that Hirsi Ali simply quit the Netherlands and has refused to grant her even a week's protection outside the country, during which she might raise funds to hire security of her own. Is this a craven attempt to placate local Muslim fanatics? A warning to other Dutch dissidents not to stir up trouble by speaking too frankly about Islam? Or just pure thoughtlessness? The Dutch government should recognize a scandal in the making and rediscover its obligation to provide Hirsi Ali with the protection she was promised. There is not a person alive more deserving of the freedoms of speech and conscience we take for granted in the West, nor is there anyone making a more courageous effort to defend them. Sam Harris is the author of "The End of Faith" and "Letter to a Christian Nation." Salman Rushdie is a novelist whose works include "Midnight's Children," which won the Booker Prize, and "The Satanic Verses."